Cities: Capital: Brasilia (pop. 2.5 million). Other cities — Sao Paulo (11.2 million), Rio de Janeiro (6.3 million), Belo Horizonte (2.4 million), Salvador (2.7 million), Fortaleza (2.4 million), Curitiba (1.7 million), Recife (1.5 million), Porto Alegre (1.4 million). Annual population growth rate: 1.17%. Ethnic groups: African, Portuguese, Italian, German, Spanish, Japanese, indigenous peoples, and people of Middle Eastern descent. Education: Literacy (2009): 90.3% of adult population. Health: Infant mortality rate (2009): 22.5/1,000. Life expectancy (2010) — 73.1 years. Work force (2009 est. ): 101.7 million. Branches: Executive: president (chief of state and head of government popularly elected to no more than two 4-year terms). Legislative — Senate (81 members popularly elected to staggered 8-year terms), Chamber of Deputies (513 members popularly elected to 4-year terms). Judicial — Supreme Federal Tribunal (11 lifetime positions appointed by the president). Political parties: Workers' Party (PT), Brazilian Democratic Movement Party (PMDB), Brazilian Social Democratic Party (PSDB), Democrats (DEM), Democratic Labor Party (PDT), Brazilian Labor Party (PTB), Party of the Republic (PR), Brazilian Socialist Party (PSB), Communist Party of Brazil (PC do B), Progressive Party (PP), Social Democratic Party (PSD), Popular Socialist Party (PPS), Green Party (PV), Socialism and Freedom Party (PSOL), National Mobilization Party (PMN), Humanistic Solidarity Party (PHS), Brazilian Republican Party (PRB), Christian Social Party (PSC), Christian Labor Party (PTC), Labor Party of Brazil (PT do B), Brazilian Communist Party (PCB), and Brazilian Labor Renewal Party (PRTB). GDP (nominal exchange rate): $2.5 trillion. GDP (purchasing power parity): $2.3 trillion. Annual real growth (2011 est. ): 3.5%. Per capita GDP (nominal exchange rate): $12,917. Per capita GDP (purchasing power parity): $11,845. Agriculture (6% of GDP): Products: soybeans, coffee, sugarcane, cocoa, rice, livestock, corn, oranges, cotton, wheat, and tobacco. Industry (28% of GDP): Types: steel, commercial aircraft, chemicals, petrochemicals, footwear, machinery, motors, vehicles, auto parts, consumer durables, cement, and lumber. Services (66% of GDP): Types: mail, telecommunications, banking, energy, commerce, and computing. Trade: Trade balance (2011): $20 billion surplus. Exports — $202 billion. Major markets — China 15%, United States 10%, Argentina 9%. Imports — $182 billion. Major suppliers — United States 15%, China 14%, and Argentina 8%. Exchange rate (October 3, 2011): U.S. $1 = 1.75 Brazilian reais. Six major groups make up the Brazilian population: the Portuguese, who colonized Brazil in the 16th century; Africans brought to Brazil as slaves; various other European, Middle Eastern, and Japanese and other Asian immigrant groups who settled in Brazil since the mid-19th century; and indigenous peoples of Tupi and Guarani language stock. Intermarriage between the Portuguese and indigenous people or slaves was common. Although the major European ethnic stock of Brazil was originally Portuguese, subsequent waves of immigration contributed to a diverse ethnic and cultural heritage. From 1875 until 1960, about 5 million Europeans immigrated to Brazil, settling mainly in the four southern states of Sao Paulo, Parana, Santa Catarina, and Rio Grande do Sul. Immigrants came mainly from Italy, Germany, Spain, Japan, Poland, and the Middle East. The largest Japanese community outside Japan is in Sao Paulo. Despite class distinctions, national identity is strong. Brazil prides itself on being open to all races. It recently began a national conversation on racial equality and entered into a memorandum of understanding with the United States on addressing racial inequality. Indigenous people, located mainly in the northern and western border regions and in the upper Amazon Basin, make up less than 1% of the population. Their numbers are declining as contact with the outside world and commercial expansion into the interior increase. Brazilian Government programs to establish indigenous reservations and to provide other forms of assistance for these groups have existed for years but are controversial. Brazil is the only Portuguese-speaking nation in the Americas. About three-quarters of all Brazilians belong to the Roman Catholic Church; most others are members of traditional Protestant denominations, members of growing evangelical movements, or follow practices derived from African religions. Pedro Alvares Cabral claimed Brazil for Portugal in 1500. The colony was ruled from Lisbon until 1808, when Dom Joao VI and the rest of the Portuguese royal family fled from Napoleon's army, and established its seat of government in Rio de Janeiro. Dom Joao VI returned to Portugal in 1821. His son declared Brazil's independence on September 7, 1822, and became emperor with the title of Dom Pedro I. His son, Dom Pedro II, ruled from 1831 to 1889, when a federal republic was established in a coup led by Deodoro da Fonseca, Marshal of the Army. Slavery had been abolished a year earlier by the Princess Regent Isabel while Dom Pedro II was in Europe. From 1889 to 1930, the government was a constitutional republic, with the presidency alternating between the dominant states of Sao Paulo and Minas Gerais. This period ended with a military coup that placed Getulio Vargas, a civilian, in the presidency; Vargas remained as dictator until 1945. Between 1945 and 1961, Brazil had six presidents: Jose Linhares, Gaspar Dutra, Vargas himself, Cafe Filho, Carlos Luz, Nereu Ramos, Juscelino Kubitschek, and Janio Quadros. When Quadros resigned in 1961, Vice President Joao Goulart succeeded him. Goulart's years in office were marked by high inflation, economic stagnation, and the increasing influence of radical political elements. The armed forces, alarmed by these developments, staged a coup on March 31, 1964. The coup leaders chose Humberto Castello Branco as president, followed by Arthur da Costa e Silva (1967-69), Emilio Garrastazu Medici (1969-74), and Ernesto Geisel (1974-79), all of whom were senior army officers. Geisel began a democratic opening that was continued by his successor, Gen. Joao Baptista de Oliveira Figueiredo (1979-85). Figueiredo permitted the return of politicians exiled or banned from political activity during the 1960s and 1970s and allowed them to run for state and federal offices in 1982. Concurrently, an electoral college consisting of all members of Congress and six delegates chosen from each state continued to choose the president. In January 1985, the electoral college voted Tancredo Neves from the opposition Brazilian Democratic Movement Party (PMDB) into office as President. Neves died 39 days later, before his presidential inauguration, from abdominal complications. Vice President Jose Sarney became President upon Neves' death. Brazil completed its transition to a popularly elected government in 1989, when Fernando Collor de Mello won 53% of the vote in the first direct presidential election in 29 years. In 1992, a major corruption scandal led to his impeachment and, ultimately, resignation. Vice President Itamar Franco took his place and governed for the remainder of Collor's term. To date, all democratically elected presidents that followed Itamar Franco started and finished their mandate with no interruptions in the constitutional order. On October 3, 1994 Fernando Henrique Cardoso was elected President with 54% of the vote. Cardoso took office January 1, 1995, and pursued a program of ambitious economic reform. He was re-elected in 1998 for a second 4-year term. Luiz Inacio Lula da Silva, commonly known as Lula, was elected president in 2002, after his fourth campaign for the office. He was re-elected in 2006 for a second 4-year term. President Lula, a former union leader, was Brazil's first working-class president. In office, he took a prudent fiscal path, warning that social reforms would take years and that Brazil had no alternative but to maintain tight fiscal austerity policies. At the same time, he made fighting poverty through conditional transfer payments an important element of his policies. In October 2010, Brazil held its sixth consecutive presidential and general elections since the reinstatement of democracy in 1985. About 130 million Brazilians, two-thirds of the country's population, were eligible to vote, a mandatory civic duty. Up for election were the President, the governors of all 26 states and of the federal district of Brasília; all 513 federal deputies; 54 senators (two-thirds of the total); and 1,057 delegates to the 27 state assemblies. Dilma Vana Rousseff, the Workers' Party (PT) candidate, won a runoff election against the Brazilian Social Democratic Party candidate, becoming the first woman president of Brazil. President Rousseff had previously served as the Minister of Mines and Energy and as the Chief of Cabinet in President Lula's administration. Rousseff took office on January 1, 2011 and has prioritized growth with equity policies to eradicate poverty and fiscal austerity. She has been a vocal defender of human rights and promoter of social inclusion, most notably gender equality, and is generally seen as a strong advocate for transparency in government. Within the first year of her government, several cabinet ministers resigned at Rousseff's urging due to accusations of graft. 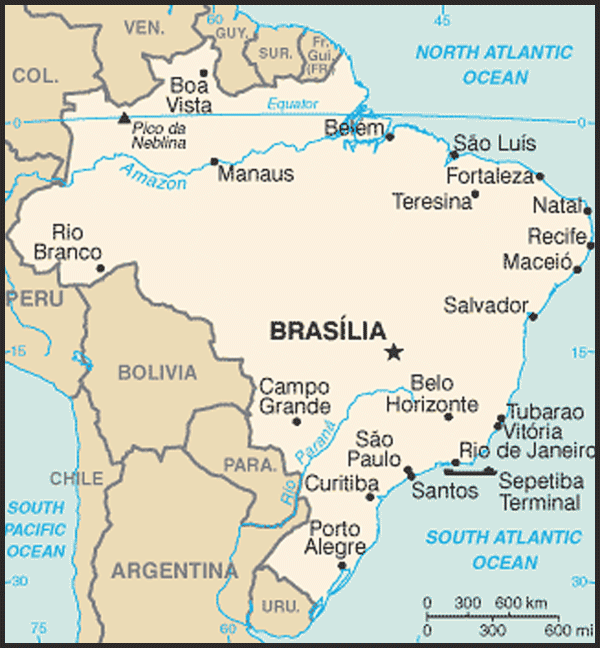 Brazil is a federal republic with 26 states and a federal district. The 1988 constitution grants broad powers to the federal government, made up of executive, legislative, and judicial branches. The president holds office for 4 years, with the right to re-election for an additional 4-year term, and appoints the cabinet. There are 81 senators, three for each state and the Federal District, and 513 deputies. Senate terms are 8 years, staggered so that two-thirds of the upper house is up for election at one time and one-third 4 years later. Chamber terms are 4 years, with elections based on a complex system of proportional representation by states. Each state is eligible for a minimum of eight seats; the largest state delegation (Sao Paulo's) is capped at 70 seats. This system is weighted in favor of geographically large but sparsely populated states. Brazil maintains an embassy (http://www.brasilemb.org/) in the United States at 3006 Massachusetts Avenue NW, Washington, DC 20008 (tel. 202-238-2700). Brazil has consulates general in New York, Chicago, Los Angeles, Miami, Houston, Boston, Atlanta, San Francisco, Hartford, and Washington, DC. The Brazilian economy's solid performance during the 2008 financial crisis and its strong and early recovery, including 2010 growth of 7.5%, have contributed to the country's transition from a regional to a global power. Expected to grow 3.5% in 2011 and 4.0% in 2012, the economy is the world's seventh-largest and is expected to rise to fifth within the next several years. During the administration of former President Lula, surging exports, economic growth, and social programs helped lift tens of millions of Brazilians out of poverty. For the first time, a majority of Brazilians are now middle-class, and domestic consumption has become an important driver of Brazilian growth. President Dilma Rousseff, who took office in January 2011, has indicated her intention to continue the former president's economic policies, including sound fiscal management, inflation control, and a floating exchange rate. Low unemployment and strong domestic demand pushed 12-month inflation to 7.3% through the first three quarters of 2011, above the upper limit of the government's target of 2.5%-6.5%. The central bank believes, however, that the global economic downturn will dampen inflationary pressure and projects inflation to fall within the target band by the end of 2011 and throughout 2012. Concerns regarding global economic conditions drove the central bank to reduce interest rates from 12.5% to 12%, the first such rate decrease since mid-2009, to keep domestic consumption high. Prolonged high interest rates have attracted foreign currency inflows that have driven up the value of the currency (the real) by nearly 30% since the start of 2009. In an effort to limit the appreciation, the government had increased dollar reserves and introduced capital controls. Brazil is generally open to and encourages foreign investment. It is the largest recipient of foreign direct investment (FDI) in Latin America, and the United States is traditionally the top foreign investor in Brazil. Since domestic savings are not sufficient to sustain long-term high growth rates, Brazil must continue to attract FDI, especially as the government plans to invest billions of dollars in off-shore oil, nuclear power, and other infrastructure sectors over the next few years. The major international athletic competitions that Brazil will host every year until the 2016 Rio Olympics are also leading the government to invest in roads, airports, sports facilities, and other areas. President Rousseff has made economic growth and poverty alleviation top priorities. Export promotion is a main component of plans to generate growth and reduce what is seen as a vulnerability to international financial market fluctuations. To increase exports, the government is seeking access to foreign markets through trade negotiations and increased export promotion, including tax breaks for exporters. Brazil has been a leading player in the World Trade Organization's Doha Round negotiations and continues to seek to bring that effort to successful conclusion. To further increase its international profile (both economically and politically), the Rousseff administration is also seeking expanded trade ties with developing countries, as well as a strengthening of the Mercosul (Mercosur in Spanish) customs union with Uruguay, Paraguay, and Argentina. In 2008, Mercosul concluded a free trade arrangement with Israel, followed by another arrangement with Egypt in 2010. Mercosul is pursuing free trade negotiations with Mexico and Canada and resumed trade negotiations with the EU. This trade bloc also plans to launch trilateral free trade negotiations with India and South Africa, building on partial trade liberalization agreements concluded with these countries in 2004. China has significantly increased its purchases of Brazilian soy, iron ore, and steel in recent years, becoming Brazil's principal export market and an important source of investment. Agriculture is a major sector of the Brazilian economy, and is key for economic growth and foreign exchange. Agriculture accounts for about 6% of GDP (25% when including agribusiness) and 36% of Brazilian exports. Brazil enjoyed a positive agricultural trade balance of $55 billion in 2009. Brazil is the world's largest producer of sugarcane, coffee, tropical fruits, frozen concentrated orange juice (FCOJ), and has the world's largest commercial cattle herd (50% larger than that of the U.S.) at 170 million animals. Brazil is also an important producer of soybeans (second to the United States), corn, cotton, cocoa, tobacco, and forest products. The remainder of agricultural output is in the livestock sector, mainly the production of beef and poultry (second to the United States), pork, milk, and seafood. About half of Brazil is covered in forests, and Brazil has the majority of the world's largest rain forest, the Amazon. A little less than 40% of the Amazon, and to a lesser extent the Cerrado (tropical savannah), is managed by national, state, or municipal governments, either as conservation units, forest concessions, or officially designated indigenous lands. In the last 30 years, migration into the Amazon and the conversion of forest land, primarily for agricultural use, reduced forest cover in the Brazilian Amazon by 20%. Through initiatives such as the revitalization of degraded pastures and forest, agriculture, and livestock integration, the government made progress in reducing deforestation for agricultural use. However, deforestation due to illegal logging remains a serious problem. In 2006, the government created the Brazilian Forest Service with the aim to manage the Amazon forest resources in a sustainable manner. Including emissions from deforestation, Brazil is one of the largest emitters of greenhouse gases. As part of its domestic commitments on climate change incorporated into legislation in 2010, Brazil inscribed a target of reducing emissions by 36.1%-38.9% below business as usual by 2020. This commitment includes further reductions in deforestation rates as well as advances on renewable energy and energy efficiency. Brazil also created a National Climate Change Fund, the country's primary means for financing national climate change policies. Figures from 2010 demonstrated that Brazil had reduced the rate of Amazon deforestation by more than 70%, its lowest rate of deforestation in over 20 years. Government officials predict that, at the current pace, Brazil's goal of reducing greenhouse gas emissions by 36.1%-38.9% could be reached by 2016 rather than 2020. Brazil also increased its programs in other biomes at risk for significant deforestation. At COP-16 in December 2010 in Cancun, the Brazilian Government delegation played an important role in developing a characterization of country commitments under the Kyoto Protocol, the central outcome of the conference. These commitments could enable Protocol proponents to continue into a second commitment period. Brazil is a regional leader in science and technology and a global leader in fields such as biofuels, agricultural research, deep-sea oil production, and remote sensing. The Brazilian Government seeks to develop an environment that is more supportive of innovation, taking scientific advances from the laboratory to the marketplace in order to promote economic growth. Yet it still faces some challenges. With the vast majority of the population living in urban areas, Brazil faces serious environmental obstacles in providing potable water to its citizens and removing and treating their waste water. U.S. Government, private sector, and academic researchers have extensive ties with Brazilian counterparts. Areas in which there is close cooperation include biofuels, medical research, remote sensing, and agriculture. The extent of bilateral scientific and technological cooperation is expanding and prospective areas in which to expand include advanced materials, telecommunications, energy transmission, and energy efficiency. Limitations to cooperation include substantial restrictions on foreign researchers collecting or studying biological materials, due to concerns over possible unauthorized taking and commercialization of genetic resources or traditional knowledge of indigenous communities (often referred to as "biopiracy"). Brazil has one of the most advanced industrial sectors in Latin America. Accounting for roughly one-third of the GDP, Brazil's diverse industries include automobiles and parts, machinery and equipment, textiles, shoes, cement, computers, aircraft, and consumer durables. Brazil continues to be a major world supplier of commodities and natural resources, with significant operations in lumber, iron ore, tin, other minerals, and petrochemicals. Brazil has a diverse and sophisticated services industry as well, including developed telecommunications, banking, energy, commerce, and computing sectors. The financial sector is secure and provides local firms with a wide range of financial products, yet interest rates remain among the highest in the world. The largest financial firms are Brazilian (and the two largest banks are government-owned), but U.S. and other foreign firms have an important share of the market. Government-initiated privatization after 1996 triggered a flood of investors in the telecom, energy, and transportation sectors. Privatization in the transportation sector has been particularly active over the last 20 years. Many antiquated and burdensome state management structures that operated in the sector were dismantled, though some still exist. The Brazilian railroad industry was privatized through concession contracts ranging from 30 to 60 years, and the ports sector is experiencing similar, albeit less expansive, privatization. In response to the dramatic deterioration in the national highway system, the federal government granted concessions for existing highways to private companies, which in turn promise to restore, maintain, and expand these highways in exchange for toll revenues generated. New opportunities are expected to arise with the opening of Brazilian civil airports to private management and investment through a federal concession model, but the initiative faces obstacles due to questions surrounding sovereignty and opposition from airport unions. The United States and Brazil signed an Air Services Liberalization Agreement in 2008 that increased commercial air travel between the two countries. In 2010, they initialed an air transportation agreement and an air transportation memorandum of understanding that, when they are signed and enter into force, will continue and expand this process. The Government of Brazil undertook an ambitious program to reduce dependence on imported oil. In the mid-1980s, imports accounted for more than 70% of Brazil's oil and derivatives needs; the net figure is now zero. Brazil announced in early 2008 the discovery of pre-salt oil fields off the coast of Brazil. The oil reserves in these fields are conservatively estimated at between 30 billion and 80 billion barrels, which would make Brazil one of the top 10 countries worldwide in reserves. Output from the existing Campos Basin and the discovery of the new fields could make Brazil a significant oil exporter by 2015. Brazil is one of the world's leading producers of hydroelectric power. Of its total installed electricity-generation capacity of 112,000 megawatts, hydropower accounts for 77,000 megawatts (69%). Brazil is also one of the world's largest biofuels producers, and sugar-based ethanol comprises over 50% of its vehicle fuel usage. Brazil and the United States, as the world's largest biofuels producers, have worked jointly through a 2007 memorandum of understanding to help make sustainable biofuels a global commodity. In 2011, that memorandum was subsumed under the Strategic Energy Dialogue, a partnership announced by President Rousseff and President Barack Obama when the latter visited Brazil in March. Like its supply of carbon-based fossil fuels, Brazil's proven mineral resources are extensive. Large iron and manganese reserves are important sources of industrial raw materials and export earnings. Mining companies, most of them Brazilian, tend to prefer to explore the deposits of nickel, tin, chromite, bauxite, beryllium, copper, lead, tungsten, zinc, gold, and other minerals. High-quality, coking-grade coal required in the steel industry is in short supply. Brazil has traditionally been a leader in the inter-American community. It has played an important role in collective security efforts, as well as in economic cooperation in the Western Hemisphere. Brazil supported the Allies in both World Wars. During World War II, its expeditionary force in Italy played a key role in the Allied victory at Monte Castello. It is a member of the Organization of American States (OAS) and a party to the Inter-American Treaty of Reciprocal Assistance (Rio Treaty). 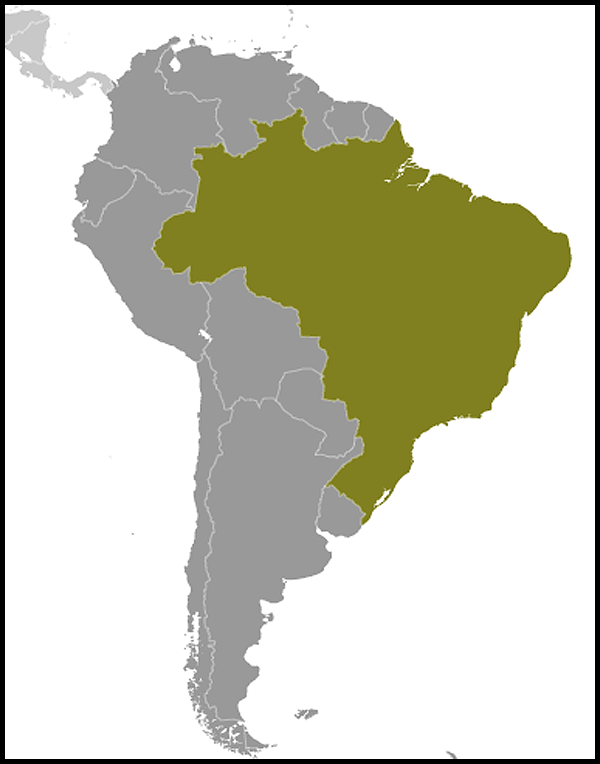 Recently, Brazil has given high priority to expanding relations with its South American neighbors and is a founding member of the Latin American Integration Association (ALADI); the Union of South American Nations (UNASUL) created in June 2004; and Mercosul, the customs union of Argentina, Uruguay, Paraguay, and Brazil, with Chile, Bolivia, Peru, Colombia, and Ecuador as associate members; Venezuela's full membership is pending. Brazil is a charter member of the United Nations and participates in its specialized agencies. It has contributed troops to UN peacekeeping efforts in the Middle East, the Democratic Republic of the Congo, Cyprus, Mozambique, Angola, East Timor, and most recently Haiti. Brazil is currently leading the UN peacekeeping force in Haiti. In 2010-2011, Brazil served as a non-permanent member of the UN Security Council. Prior to this, it had been a member of the UN Security Council nine times. Brazil is seeking a permanent position on the Council. As Brazil's domestic economy has grown and diversified, the country has become increasingly involved in international economic and trade policy discussions. For example, Brazil was a leader of the G-20 group of nations and in 2009 became a creditor country to the International Monetary Fund (IMF). The U.S., Western Europe, and Japan are primary markets for Brazilian exports and sources of foreign lending and investment. 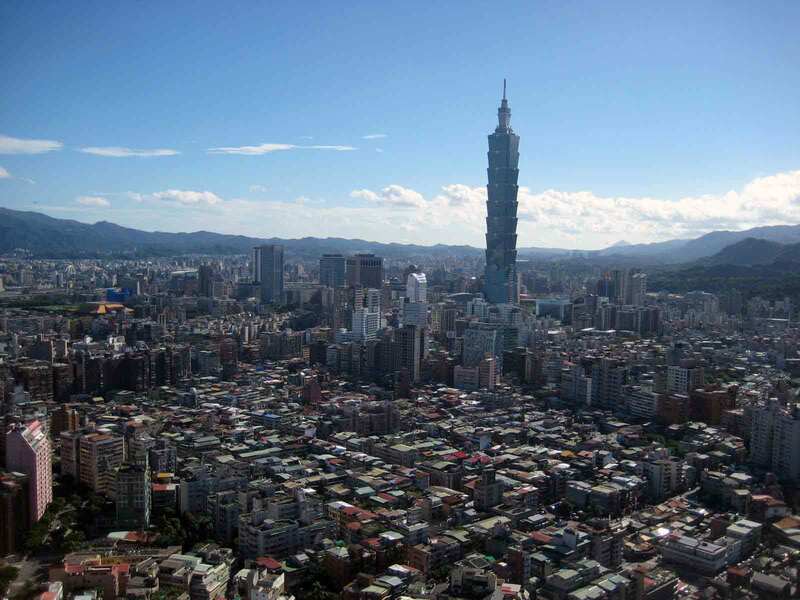 China is a growing market for Brazilian exports. Brazil also bolstered its commitment to nonproliferation through ratification of the nuclear Non-Proliferation Treaty (NPT), signing a full-scale nuclear safeguards agreement with the International Atomic Energy Agency (IAEA), acceding to the Treaty of Tlatelolco, and joining the Missile Technology Control Regime (MTCR) and the Nuclear Suppliers Group. The United States and Brazil have traditionally enjoyed friendly, active relations encompassing a broad political and economic agenda. The excellent bilateral relationship was foreshadowed when United States was the first country to recognize Brazil's independence in 1822. Since then, deepening U.S.-Brazil engagement and cooperation are reflected in high-level contacts between the two governments. Most recently, there have been reciprocal visits by President George W. Bush and President Lula in March 2007, President Obama's visit to Brazil in March 2011, and six other cabinet-level and cabinet-rank visits in the first part of 2011. Secretary of State Hillary Clinton attended the January 1, 2011 inauguration of President Dilma Rousseff. As the two largest democracies and economies in the Western Hemisphere, the U.S. and Brazil are in the process of consolidating the foundation for a new partnership for the 21st century. In the aftermath of President Obama's March 2011 visit, a series of cabinet-level dialogues were created or reinvigorated. The second annual Global Partnership Dialogue, chaired by Secretary Clinton and Foreign Minister Antonio Patriota, met in Washington, DC in June 2011 and was followed by the Economic and Financial Dialogue in July and the Strategic Energy Dialogue in August. These dialogues are the primary vehicles for policy coordination and for defining partnership priorities. The 10 agreements signed between the U.S. and Brazil at the time of President Obama's 2011 visit testify to an intensification of bilateral engagement in a broad range of areas that involve major interests of both countries. The formal intergovernmental dialogues involve multiple U.S. and Brazilian agencies that report directly to both presidents on issues relating to politics, economics, trade, finance, agriculture, energy, technology, innovation, the environment, defense, and nonproliferation. Bilateral relations are complemented by people-to-people initiatives and trilateral and multilateral cooperation. To foster and increase the existing goodwill and understanding between the people of the United States and Brazil, 50,000 Brazilian secondary and post-secondary students will be selected by the Brazilian Government for exchange programs in United States in the next 5 years. The United States and Brazil also undertake trilateral cooperation in third countries, particularly in support of development programs focused on food security, health, and women's rights. To facilitate such programs, a memorandum of understanding to advance trilateral cooperation was signed in March 2011 during President Obama's trip to Brazil. Multilaterally, the closeness of U.S.-Brazil relations is evidenced by the launch of the Open Government Partnership on the margins of the 2011 UN General Assembly, in which Brazil and the U.S. head a multi-country initiative to foster transparency. In addition to recently signed initiatives and periodic meetings, the governments of Brazil and the United States have a long-standing collaboration on biofuels and eliminating racial discrimination. Under the memorandum of understanding signed in 2007, Brazil and the U.S. have worked together to advance biofuels cooperation, both bilaterally and globally. In March 2008, Secretary of State Condoleezza Rice visited Brazil and signed a historic Joint Action Plan to Eliminate Racial and Ethnic Discrimination and Promote Equality (http://www.state.gov/p/wha/rls/2008/111446.htm). The plan calls for Brazil and the United States to work jointly in combating racial discrimination and sharing best practices in tackling discrimination in the areas of education, law enforcement, labor, health, and many other areas. There has been cooperation on trilateral development programs in Mozambique in the health sector and food security, with plans or programs extending this cooperation to additional countries in Africa, Haiti, and El Salvador. The U.S. embassy and consulates in Brazil provide a wide range of services to U.S. citizens and business. Political, economic, and science officers deal directly with the Brazilian Government in advancing U.S. interests but are also available to brief U.S. citizens on general conditions in the country. Attaches from the U.S. Commercial Service and Foreign Agriculture Service work closely with hundreds of U.S. companies that maintain offices in Brazil. These officers provide information on Brazilian trade and industry regulations and administer several programs to aid U.S. companies starting or maintaining business ventures in Brazil. The number of trade events and U.S. companies traveling to Brazil to participate in U.S. Commercial Service and Foreign Agriculture Service programs tripled over the last 3 years. The consular section of the embassy, the consulates, and the consular agents provide vital services to the estimated 70,000 U.S. citizens residing in Brazil. Among other services, the consular sections assist Americans who wish to participate in U.S. elections while abroad and provide U.S. tax information. Besides the U.S. residents living in Brazil, some 150,000 U.S. citizens visit annually. The consular sections offer passport and emergency services to U.S. tourists as needed during their stay in Brazil. The U.S. Mission in Brazil is the third-largest visa operation in the world, issuing over 820,000 visas in FY 2011. The consulate in Sao Paulo is the largest non-immigrant visa issuing post, conducting over 3,000 visa interviews a day. It is expected that Brazilian travel to the U.S. will increase 198% by 2015. Brazilian tourists spent $4.57 billion in the U.S. economy in 2009. The U.S. Embassy in Brasilia is located at SES Avenida das Nacoes, quadra 801, lote 3, Brasilia, DF, CEP: 70.403-900 (tel. 55-61-3312-7000), (fax 55-61-3225-9136). Internet: (http://brazil.usembassy.gov/).